You just want someone to make you a cup of tea. When our kids are sick, regardless of the fact that they are supposedly considered adults, it feels awful when they are far away; rendering us unable to tend to help. However, you would be amazed at how quickly a care package can get to them and it will surely make you both feel better. (UPS is generally overnight from one Florida destination to another.) 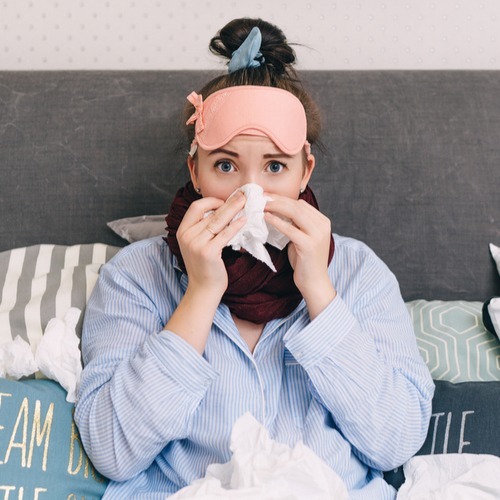 Depending on what is ailing them, even the most simple of care packages filled with soft tissues, lozenges, some Kind bars, Emergen-C, a few fun teas, Sudafed, Clorox wipes, cozy socks and maybe some homemade brownies can feel so good. For those of you that think a little matzoh ball soup can cure anything, the Hillel at UCF will deliver hot soup to your ailing student through the Jewish Penicillin Hotline. (You don’t have to be Jewish to order from here.) And if this is the route you want to take, there is also GrandmasChickenSoup.com. They actually have complete meals as well as soup and other goodies. I hear that chicken soup can heal anything. If they are really too weak to shop for themselves there are a number of delivery companies that will bring them what they need too. Check out our blog on delivery companies here. Or you can just type in care packages for sick college student into your Amazon page and find a bunch of choices. If you have Prime, it should be there quickly. There are a few other companies that have pre-made “Get Well” baskets and packages as well. Etsy has some great get well soon care packages with lip balms, candles and herbal rubs, teas and more). Or a fresh pair of sweatpants or pajamas can feel pretty nice if they are spending a fair amount of time in bed. Many companies, like Macy’s or Nordstrom, will rush an order for a fee. Gap makes these pajamas called print joggers made from a soft, lightweight modal jersey knit. My daughters love them because they are super soft, comfortable and when they are not feeling well, that is usually what I find them wearing- they “borrowed” mine and well, let’s just say, I never saw them again. Make sure you search using the print joggers in modal. Locally there are Insomnia Cookies, which should also do the trick. No matter what sort of package you are sending be sure to double check the mailing address. Too many times we have heard of packages arriving, but never getting to the right recipient. Nothing cheers any college student up more than a handwritten letter from home so no matter what you send, put one of those in there too. I usually like to send it with a print out of our dog, because that always brings a smile to all our faces. Should you need your student’s official dorm address check here. For more great tips, read through our other blogs, follow us on Facebook and Instagram at.haveuheard.com and share with other parents you know.